O’KEY School uses a system of validation of language skills, which corresponds to the international classification of language levels, set up by the Common European Framework of Reference for Languages: Learning, Teaching, Assessment (CEFR). This document was put together by the Council of Europe, and it provides a practical tool for setting clear standards to be attained at successive stages of learning, and for evaluating outcomes in an internationally comparable manner. The CEFR systematically outlines the skills necessary for communication, the related knowledge and application, and finally, the situations and environments for communicating. Beginner Level. I have never studied a foreign language before, or I can only understand a few words. I do find it hard to communicate and make a lot of grammar mistakes. Elementary Level. I can understand and use familiar everyday expressions and very basic phrases aimed at the satisfaction of needs of a concrete type. I can introduce myself and others and can ask and answer questions about personal details such as where I live, people I know and things I have. I can interact in a simple way provided the other person talks slowly and clearly and is prepared to help. I can understand simple short texts and simple sentences, write a postcard, complete a simple form (name, nationality, address, etc). Pre-Intermediate Level. I can understand sentences and frequently used expressions related to areas of most immediate relevance (e.g. basic personal and family information, shopping, local geography, employment). I can communicate in simple and routine tasks requiring a simple and direct exchange of information on familiar and routine matters. I can describe in simple terms aspects of my background, immediate environment and matters in areas of immediate need. I can find concrete information in simple routine texts like adverts, brochures, menus, and timetables. I can understand and write simple personal letters, notes, and messages (e.g. thank-you letters). Intermediate Level. I can understand the main points of clear standard input on familiar matters regularly encountered in work, school, leisure, etc. I can deal with most situations likely to arise whilst travelling in an area where the language is spoken. I can produce simple connected text on topics which are familiar or of personal interest. I can describe experiences and events, dreams, hopes & ambitions and briefly give reasons and explanations for opinions and plans. I can understand texts based on the language of routine and professional communication. I can understand events, feelings, and plans described in personal letters. I can produce short logical texts on topics which are familiar or of personal interest. I can write personal letters expressing my personal emotions and impressions. Upper-Intermediate Level. I can understand the main ideas of complex text on both concrete and abstract topics, including technical discussions in my field of specialization. I can interact with a degree of fluency and spontaneity that makes regular interaction with native speakers quite possible without strain for either party. I can produce clear, detailed text on a wide range of subjects and explain a viewpoint on a topical issue giving the advantages and disadvantages of various options. I can write argumentative and descriptive essays and reports. I can write letters stressing events and experiences of vital importance to me. Advanced Level. I can understand a wide range of demanding, longer texts, and recognise implicit meaning. I can express myself fluently and spontaneously without much obvious searching for expressions. I can use language flexibly and effectively for social, academic and professional purposes. I can produce clear, well-structured, detailed texts on complex subjects, showing controlled use of organisational patterns, connectors and cohesive devices. I can choose an appropriate language style depending on a potential recipient. After completing Advanced level you can continue your study at Proficiency level, which is considered the highest. At this level, students can understand with ease virtually everything heard or read. They can summarise information from different spoken and written sources; reconstructing arguments and accounts in a coherent presentation. Students can express themselves spontaneously, fluently and precisely; differentiating finer shades of meaning even in the most complex situations. They can produce detailed and logically structured letters, reports, and articles, as well as CVs and reviews of both professional articles and literary pieces. Knowledge and skills acquired during the course of study are carefully monitored. At regular intervals throughout the course and at the end of it, all students are tested and receive a personal report containing their results. For additional information on your child’s results, you can always ask their teacher or the school’s receptionist. Providing test results are satisfactory, students will obtain a certificate and proceed to the next level course. If not, we recommend revision of the material on the same level course. The certificate can be used as validation of your language study, but it can neither replace international exam certificates if these are needed, nor give professional qualifications for working with foreign languages. The certificate is only issued to those students who have completed the whole academic year course (or at least 70 per cent of the course). 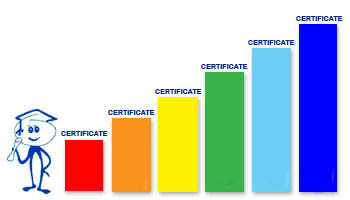 The necessary condition for obtaining a certificate is a satisfactory test result in all four skills tested (correct answers in the written test must total over 70 per cent of all test answers). A student has the right to take a final exam and get a certificate before the end of the course (only for a valid reason and not earlier than one month before the end of the course).